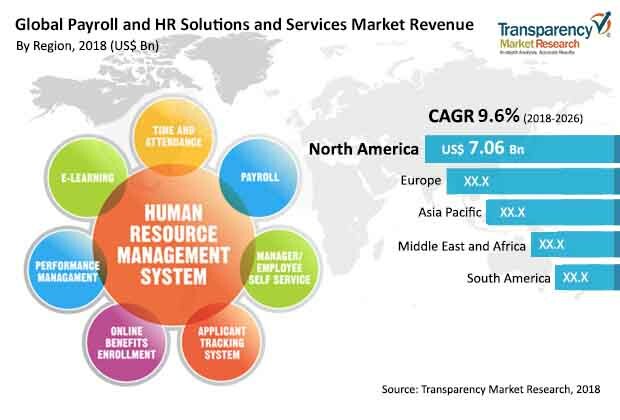 According to a new market report published by Transparency Market Research, the global payroll & HR solutions & services market was valued at US$ 17.2 Bn in 2016 and is expected to expand at a CAGR of 9.6% from 2018 to 2026, reaching US$ 41.6 Bn by the end of the forecast period. According to the report, North America was the largest contributor in terms of revenue to the payroll & HR solutions & services market in 2016. The key driver for the global HR and payroll services market is increasing adoption of cloud technologies such as SaaS (Software as a Service) technology in enterprises. Demand for cloud based payroll systems is increasing globally. Cloud based HR payroll software and solution provides better access. Moreover, a cloud based service allows business outsourced payroll systems to scale up with employees joining and exiting. Moreover, need for an efficient management system further boosts the demand for payroll & HR solutions & services. Talent management technology is one of the most rapidly changing trends in the global payroll & HR solutions & services market. Around 80% of enterprises are planning to purchase or upgrade their solutions in a talent platform. While enterprises which are using standalone software solutions continue in targeted functional areas that have unique requirements, more than half of the respondents are looking to replace former best-of-breed, highly customized or niche solutions with an integrated talent suite. The global market for payroll & HR solutions & services is segmented on the basis of deployment, enterprise size, solution, industry and geography. Based on deployment, the market is segmented into cloud, on premise, and hybrid. In 2017, the cloud segment accounted for the largest market share, in terms of revenue of the global payroll & HR solutions & services market. Furthermore, demand for cloud is expected to increase during the forecast period. On the basis of enterprise size, the global payroll & HR solutions & services market is bisected into small & medium enterprises and large enterprise. Based on solution, the market is categorized into software and services. The software segment is further fragmented into suite and standalone. The standalone sub segment is classified into payroll and compensation management, time and attendance management, compliance management, workforce management, claims administration, employee benefits management, hire management and others (tax management, report generation, etc.). In terms of industry vertical, the market is divided into banking, financial services, and insurance (BFSI), government, healthcare, manufacturing, retail, telecom and IT, transportation and logistics and others. Geographically, the global payroll & HR solutions & services market is bifurcated into North America, Asia Pacific, Europe, South America, and Middle East & Africa. North America is a major contributor to the global market fueled by the presence of a large number of HR solution providers in the region. However, presence of several emerging economies such as China, India, and South Korea are expected to drive the Asia Pacific market. The growth in the Asia Pacific market can be attributed to increasing government initiatives supporting the digitization of business processes and adoption of cloud-based systems. Major industry players in the payroll & HR solutions & services market are adopting different strategic initiatives such as mergers and acquisitions, partnerships, and collaborations for technologies and new product development. For instance, in May 2016, TMF Group acquired Swain & Associates Inc., service provider of HR & payroll and accounting & tax, based in Toronto, Canada. The global payroll & HR solutions & services market includes key players such as Automatic Data Processing, Inc. (ADP), Paycor, Inc., Paycom Software, Inc., TMF Group Holding B.V., SAP SE, Sage Group plc.,Paychex, Inc., Ramco Systems Limited, Kronos Incorporated , Paylocity Corporation, Ultimate Software Group, Oracle Corporation, Jobvite, Inc., Intuit Inc., and TriNet Group, Inc.